This 9" doll is Louisa and this is her story . . . The new plaid for the new edition. 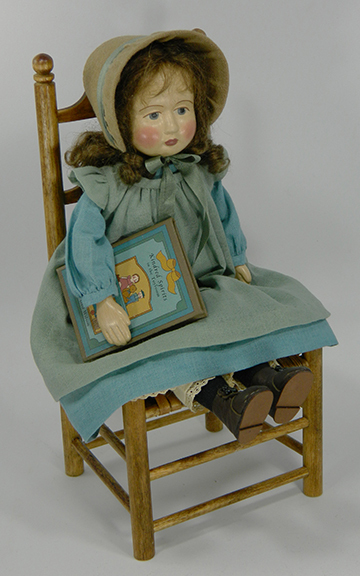 This doll was made for a show of the work of the master craftsmen who are jurors for the League of NH Craftsmen to commemorate their new headquarters. The entries were supposed to be representative of our best work over the years. 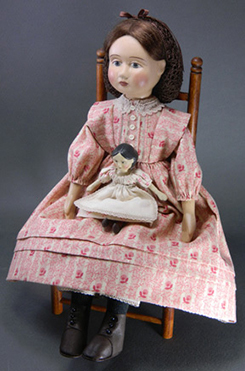 I chose to do a larger version of my 9" Louisa Doll which is 12" standing, who is a doll of a child in the late 1800's. Like Louisa in every way except for size and color scheme, she has papier mache molded parts, a mohair wig with a hand crocheted snood of silk thread, hand crocheted laces (on both dolls) and her tiny collar. She wears leather high button shoes, has her own Greiner doll with papier mache head and shoulderplate on a tiny painted cloth body with red stockings and even thumbs on her tiny leather-like hands. Both are sitting in my ladderback chair made for her with a split ash woven seat. A limited edition of 12. $750. THIS EDITION IS SOLD OUT. MY NEW DOLLS - My entire career of 35 years began with a small 8" doll hand press molded in primitive molds I made before I knew anything about dolls or moldmaking. I made thousands of these dolls and stopped forever their production in about 1995 with the idea that someday I would make another doll like them but in molded papier mache. This doll is the first of these dolls. The theme of this first edtion is sort of snap shots in history. Every edition will be extremely limited - this one in this fabric is limited to 10. All signed and numbered with story tags. Dolls have such details as hand crocheted lace and snoods, real leather shoes and perfectly tailored outfits and accessories. They represent all that I have learned in my 35 years of dollmaking. 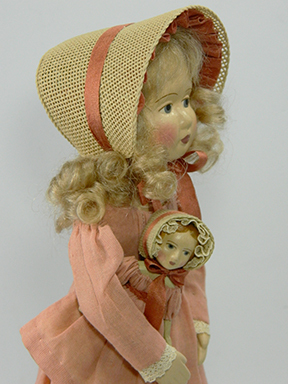 Louisa - A 9” papier mache doll with her new Greiner doll, a papier mache doll made in this time period by German immigrant, Ludwig Greiner. 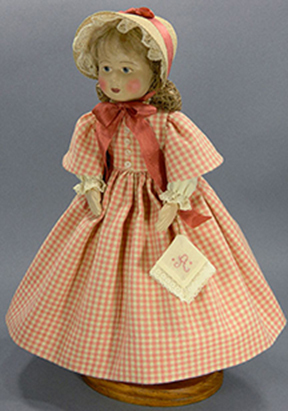 These were some of the first American made dolls available commercially. Small Greiner has papier mache head and shoulderplate on a tiny painted cloth body with red stockings and even thumbs on her tiny leather-like hands. Louisa has English mohair wig with hand crocheted snood, hand crocheted lace color and other laces, high buttoned leather shoes and silk stockings. No other doll has received so many requests long after two runs have sold out. Recently I came upon enough of the brown fabric hidden in a box to do another edition of 12. All will be same except improvement in body construction and better leather shoes. Taking pre-orders now (20% deposit). This 9" doll was made exclusively for the 2016 UFDC Convention held in Washington DC - an edition of 110 and included her illustrated book explaining my interpretation of the theme of the convention, Kindred Spirits (read the insides of the book on my Hints page). She is sold out but due to requests, I will be doing a similar doll soon. 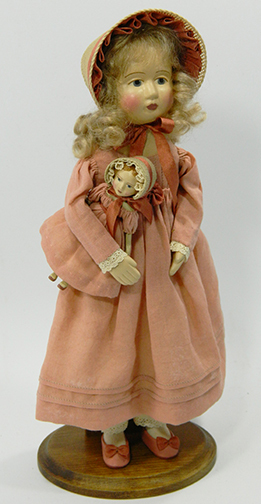 Announcing a 9" papier mache doll inspired by "A is for Annabelle" by Tasha Tudor. This is only a finished doll (sorry, no kit available) in a limited edition. Doll parts from the same mold as Louisa, the UFDC Kindred Spirits, Elizabeth and the Christmas Girl. In fact, my Annabelle actually was born from the blending together of having recently completed the Elizabeth doll above and wanting a doll for a Tasha Tudor workshop, so you can see for yourself that it was an easy next step. Most of my customers are very familiar with the wonderful works of Tasha Tudor and indeed I have been inspired by her images since I first saw them in 1980. My Annabelle version will be recognized from the cover of the alphabet book shown below. She will have a blonde mohair wig with a handcrocheted snood (hard to see in the picture), wearing a bonnet with lace ruffle trim, a pink gingham dress in the late 1800's style with full petticoat and pantalets and pink leather slippers. 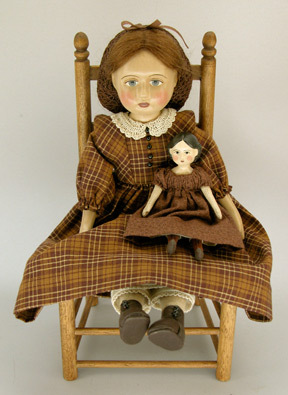 The doll will come with a wooden stand and a lace trimmed handkerchief with the letter A embroidered as her accessory. Sorry, these are now all sold. Watch for a tiny one (3.5" tall) later in 2019.